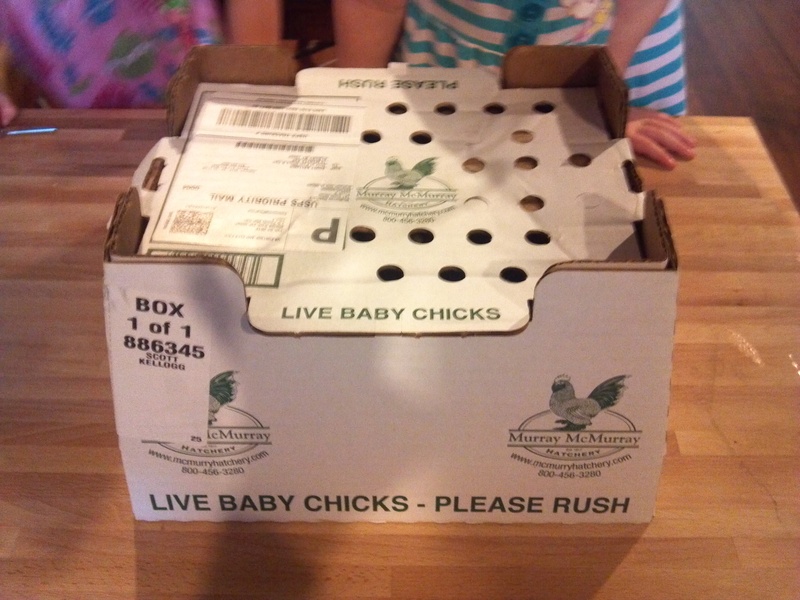 On February 1st, we received a package in the mail with 28 day old chicks inside. 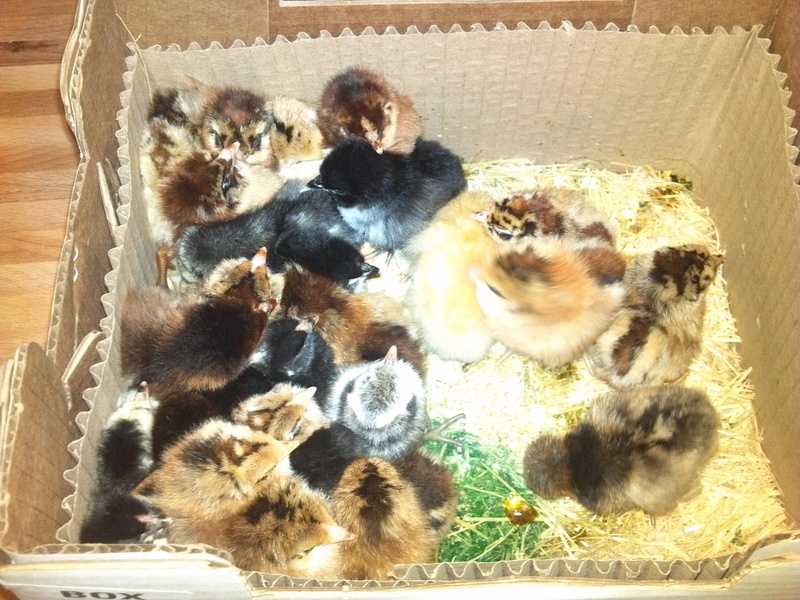 We ordered mostly Araucanas – a heritage breed chicken known for laying green and blue eggs. They are hardy, smart, and beautiful birds – almost appearing hawk-like. We filled in the order with some other fun breed birds. As a rule of thumb, baby chicks need to be kept at 95 degrees F during their first week of life. After that, the temperature can be dropped by 5 degrees a week. We used a combination of heating pads and an incandescent light to keep them warm. We made a very basic rectangular brooder box with 1 x 8 hemlock boards, topped with chicken wire (to prevent anything from eating them) and rigid foam insulation (to keep them warm) and moved them into the greenhouse after the first week. How quickly they grew! We soon had to add another level to the brooder box to give them more head space. They soon outgrew that as well. We still hadn’t begun construction of the outdoor coop, so we decided to experiment. We put them in with the rabbits. At first, after some initial hesitant curiosity, the 2 groups kept to themselves for the most part. As the chickens grew larger they all began to mix. 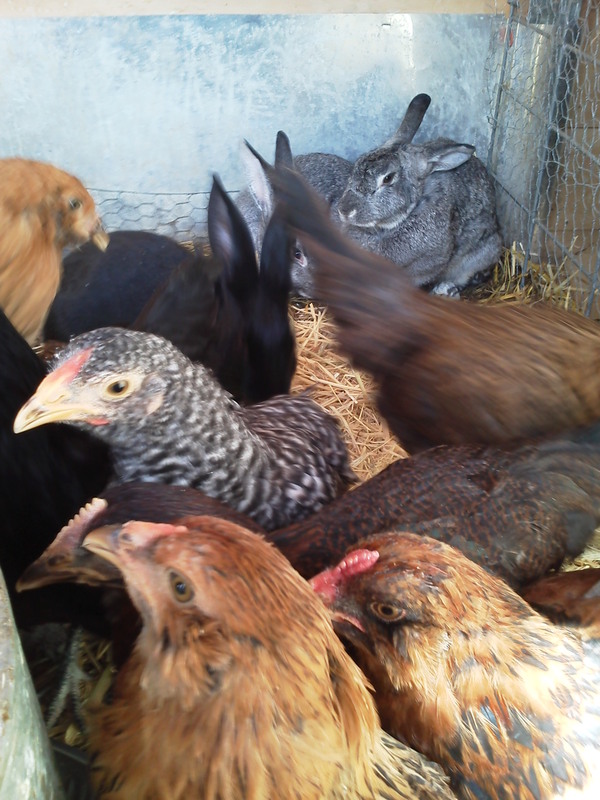 Overall, we would say that chicken-rabbit polyculture can work, but we suspect the chickens were involved in the death of a few baby rabbits. The only successful rabbit kindle during the time they were roommates was wisely born under a hutch, where the chickens could not go. 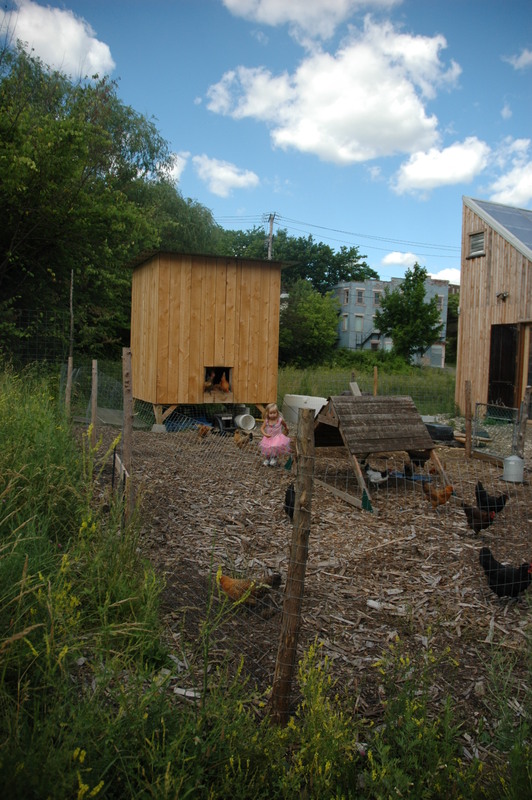 In the beginning of May the coop and run was finished enough to move them in! This is great, I’ve been playing with the idea of getting a few chickens. My aunt has been rescueing chickens for the past year now and been keeping them on our family farm in earlton, ny. So far she has been very successful, they are always laying eggs. Recently she got a few goats and now makes her own soap!